Allegro is pleased to introduce the new Cando Pedal Magneciser, the latest addition to our line of resistive pedal exercisers. With a smooth and quiet patented magnetic resistance system, the rotor Magneciser pedal exerciser is the perfect alternative to traditional stationary bikes. The rotor Magneciser is used for UPPER and LOWER body exercises as an arm ergometer or leg pedlar. This versatility allows the user to improve circulation, muscle strength, joint range-of-motion and coordination for the entire body. A fully automatic 5-function digital display indicates the speed, time exercised, calories consumed, distance "traveled" and scan of all functions. The Magneciser Resistive Pedal Exerciser has a convenient tension control that allows a broad range of pedal resistance for a progressive exercise program. With an adjustable base for stability and storage, the rotor Magneciser is small, portable and lightweight, great for use anytime, anywhere. NOTE: The Magneciser machine is NOT motorized and requires some muscle strength to operate. Smooth Operation. Easy To Adjust. Easy To Use. Quiet Operation. Easy To Setup. Comfortable. Stable. Great for upper body. General Fitness. Physical Therapy. Heart Rate Training. Casual/ Recreational. paraplegic for 50 yrs.. This product is only a stable as the surface you place it on. I have mine on a small dinette table and it works great, no stability problems as others have encountered. Easy To Setup. Quiet Operation. Smooth Operation. Stable. Easy To Adjust. Comfortable. Easy To Use. Physical Therapy. Low Impact Exercise. This product is good for low impact exercises. I am disabled, so I cannot do even moderate exercises due to spinal problems in multiple locations. Smooth Operation. Easy To Use. Quiet Operation. Easy To Setup. Stable. Low Impact Exercise. Physical Therapy. Much better than expected, was suggested by Chiropractor who uses this exact product in his office. Great for both arms and legs. Easy To Use. Quiet Operation. Comfortable. Stable. Weight Loss. Low Impact Exercise. Physical Therapy. Conditioning Exerciser. home bound senior. Easy To Use. Easy To Setup. Smooth Operation. Quiet Operation. Comfortable. Easy To Adjust. General Fitness. Weight Loss. Physical Therapy. Low Impact Exercise. by Little Banshee from Los Angeles, CA. Purchased the Magneciser Pedal Exerciser....cannot get the left pedal attached. Think there are threads missing on the screw!!!! Help!!!! 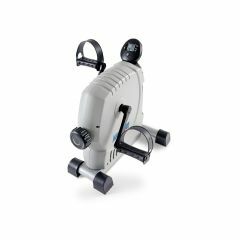 Using a Model 18030 Magneciser in a physical therapy setting, it would seem there may be some alternative "pedals" that would more easily accommodate use for arm exercises. What do you have to offer? I sent an email to get some info about the Magneciser Pedal Exerciser pertaining to my sons disability if this is good for him since he is a Quadripalegic but I never received a response. I also asked how high is this machine because my son sits on his power wheelchair. I am really hoping that this will help stimulate his legs to loosen up his joints and hopefully would lessen his spasms. I am still waiting for the response. Best check with his Physiatrist first, as this may prove only a PROM (passive range of motion) assist device, depending on his condition. That might decrease contractures, but depending on spinal origin of spasms, may not actually decrease muscle spasms. If I exercise 1/2 hr to 45 mins per evening when can I see results? Is it easy to store? First of all I believe exercising is best in late A.M. after a good breakfast and doing stretching to loosen up. Then, "go for it." I'm a Para for 50 yrs. Where can I find replacement parts for this magneciser?